Come experience a true Parisian evening that will satisfy both your quest for culture, and for a fun show. The evening begins with a lovely dinner cruise on the Seine, followed by a visit to the Eiffel Tower’s second floor, and ends with the famous cabaret show at the Moulin Rouge. You will feel really spoiled when you are picked up from your Paris address and whisked away to this wonderful evening. Your PARISCityVISION chauffeur/guide will come pick you up at your hotel or apartment in Paris, in a comfortable, air conditioned mini-bus. He will drive you first to the Port de Solférino, near the Musée d’Orsay, to board the boat restaurant in La Marina. 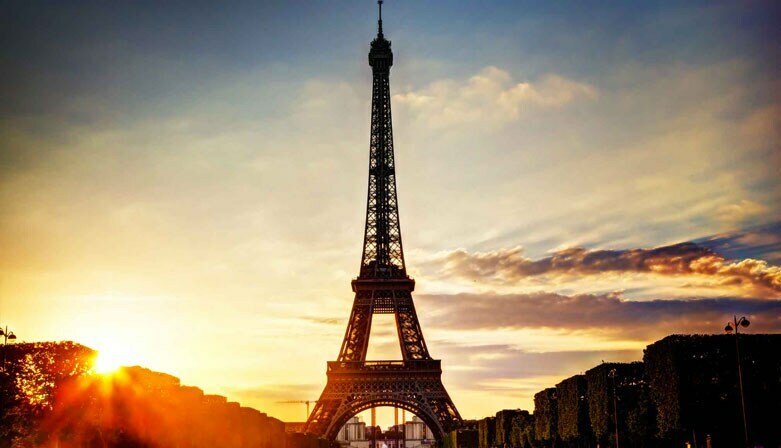 You will then experience an unforgettable cruise: while enjoying a gourmet dinner based on traditional French cuisine, you will be fascinated by the beautiful views of Paris that pass before your eyes. While underway, you will feel Paris unfold around you, all the beautiful sights of Paris along the banks of the Seine, and the magnificent bridges you pass under. After an hour’s boat ride, your chauffeur/guide will then transport you to the very symbol of Paris: the Eiffel Tower. With your priority access ticket, he quickly takes you to the second floor of the Iron Lady. At 115 meters in the air, you will marvel at the unique panorama that surrounds you. Then you can move about freely for about an hour, strolling around the tower to view all of the incredible sights of Paris that will appear on the horizon. Depending on the time of year, some of them will be beautifully illuminated. In the distance, you will see the Sacré Cœur overhanging the Butte Montmartre, the golden dome of the Invalides, the impressive Tour Montparnasse, the majestic Arc de Triomphe dominating the Champs Elysées or the famous Louvre, formerly the Palais Royal. After enjoying this incredible view, you will leave with your chauffeur/guide towards Montmartre to enter the “temple” of the famous French cancan. There, you will attend a not to be missed Moulin Rouge spectacle, where the Doriss Girls light up the scene with their costumes of feathers and sequins. During the show, you will be served a ½ bottle of Champagne. While sipping your champagne, you will be blown away by the non stop acts danced to bewitching rhythms, one more surprising than the next. You also marvel at the quality of the performances of the dancers and the acrobats. Some of the numbers in the show include the Pirates, the Cirque, with its unforgettable acrobats and the giant aquarium, all performed to a musical arrangement that includes 80 musicians and 60 singers. Attention: We can’t guarantee that you will be seated next to the bay windows. You can't pay online an extra-fee to choose your seat in the boat. Depending on the availability of the tables, you can ask for a window seat directly on the spot, paying 10 € per person.